3rd rack wasn't a charm. Noise. Shudder. Starting in October 2016. 1990 Volvo 740 GL wagon. Loss of power steering fluid. Diagnosed as needing rack replacement. Bad rack or mechanic, that rack failed. Same mechanic, 2nd rack, fluid in boots, rack failure. Third rack installed in March- different manufacturer - same mechanic. Today, I picked up the car from a different mechanic - the banjo fitting was bad and the car had a gas leak. And, 2 lbs of air was added to all tires. That was it. Leaving the lot, turning, the noise again, turning wheel right, and even turning left, with steering wheel vibration. I asked the mechanics to verify. They think it is the rack - again. This would be the premium new rack from March. The power steering fluid pump was never changed. The original mechanic won't touch the car. All the mechanics at the new shop said that the whole front of the car was shuddering while in park. I was there. I heard it. I saw it. What the heck do I do now. Try the new power steering pump? Where did you get your rack? Not from the business you noted. I'll end this inquiry with this post. I had an original rack last about 350k kms until I needed a new one. I managed to snag one off a car with 250k. What I found was that initially, it was lumpy and shuddered at full lock, as well as when performing quick parking lot maneuvers. Over a few months, it smoothed out, but would still noticeably shudder occasionally. I am still running the original pump. What solved it for me was performing a few fluid flushes over a span of a few months, adding a magnefine filter, and placing a strong magnet inside the reservoir. Knock on wood, it's been great ever since, adding about 100k kms since the fix. Thank you for that information. When able, I would consider multiple flushes over the craps shoot of having the pump replaced, I think. There has been no evidence of infiltrate in the reservoir, but ? I am writing down your fixes, and will hold onto them until I am able to tackle this problem further. Meanwhile, I guess I won't be driving more than 20 miles at a time.. or something. Thank you. Even if you "flush" the system by just emptying and refilling the reservoir, that should help over time. Additionally, adding a filter is very cheap and easy. You just need a length of 3/8" hydraulic hose (don't use fuel hose) and a magnefine filter, in total should cost you less than $50. A filter is always a good idea since there will inevitably be leftover bits from your old steering racks circulating in your system. It will certainly prolong the life of the rack. Did you also make sure your belt on the pump is properly tightened and not too worn? That could be a contributing factor. You had to bring up belts. My mind has gone blank. I can't think whether the V belt is also the belt for the pump. But, I had the V belt replaced. I am so fried on this. I can't read a diagram or schematic, so that doesn't help. Did I already say that I am so fried with this. 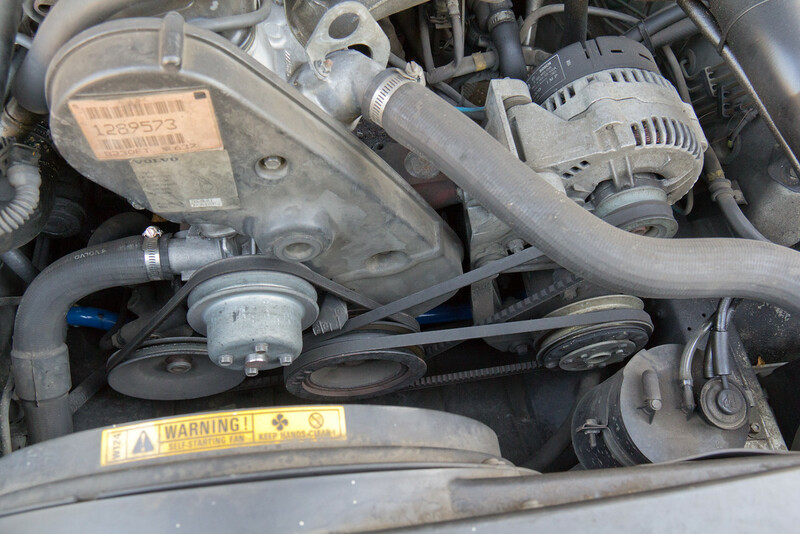 There should be two v-belts, only one of which drives the power steering pump. Okay, then. I will check in the morning. I thought only the one V-belt was replaced, and the only other belt addressed was the a/c belt, which was cut off. I don't want this to drive you to distraction, (which it has probably already done), so, I will thank you, yet again. my 92 had, I think, 3 belts. let me find the picture. yeah, one belt for the alternator, one for the a/c compressor, and the third belt for the water pump and power steering. different years, however, have different configurations. also, my 92 was a turbo. Great photo. I'm glad you wrote because after having been at the garage, yet again, I've really had it, and forgot to check the belts. The return line on the gas filter had almost blown - this, after having the intake line and banjo fitting replaced. It happened the next day. Now, apart from all this, after the additional line repair, I have almost no rack noise when I turn. Now, you tell me - is a model of my car sitting somewhere with pins stuck into it. What the heck would the one thing have to do with the other, except that something might have gotten bent back into place when the car was on the lift -- yet again. Quick Reply: 3rd rack wasn't a charm. Noise. Shudder.